Are all clients connecting to a given deployment server permitted to do so? Is the client certain that the deployment server they are talking to is the real one and not an impostor? I’ve highlighted the “Deployment server to deployment clients” part. That’s where we will focus our efforts today. The advice here is to use pass4SymmKey in order to secure Deployment Client to Deployment Server. As a reminder, pass4SymmKey is a symmetric secret shared between two Splunk nodes to authenticate system-to-system REST API usage. The pass4SymmKey comes up frequently in conversations about License Masters, Cluster Masters, and Search Head Clustering. But, in my experience, the use of pass4SymmKey related to Deployment Server is rare. Let’s look into this a little deeper. The Splunk server.conf file- has a pass4SymmKey option that can be set in a few different stanzas, so you can use a different value for different modes of communication. At a minimum, there is one in the [general] stanza and one in the [clustering] stanza. I’m going to steal a quote from the $SPLUNK_HOME/etc/system/README/server.conf.spec file. There’s two quick caveats right out of the box. First, the Deployment Client -> Deployment Server pass4SymmKey and the License Slave -> License Master pass4SymmKey are set using the same setting. So, if you have a Deployment Server that is also a License Slave, then you’ll have to use the same pass4SymmKey all around. This is probably not ideal. 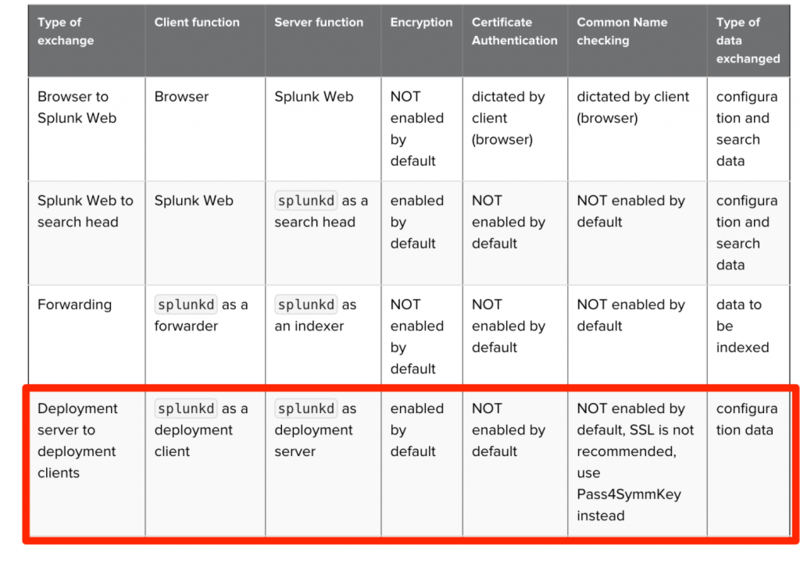 Splunk Support will usually give you a “Deployment Server License” file. It’s a 0 byte license that enables the Enterprise features. This way, your DS isn’t depending on your License Master and you can use different pass4SymmKeys for your DS/DC comms and your LM/LS comms. Second, you have to explicitly enable the use of pass4SymmKey for Deployment Server. That is what we will do today, and we will review the security properties achieved by this. From the docs, this appears to have been added (to the spec files at least) around version 6.2.4, see SPL-99169. But, it’s not been (to my knowledge) very well advertised. Maybe this post and the docs feedback I’m submitting will help publicize it a little more. But, given this new knowledge, we should be able to use a different pass4SymmKey for DC/DS as we do for license master connectivity — assuming we have a “reasonably modern” Splunk on both ends. So let’s set up our DS to expect a pass4SymmKey, and our UF to use the same one to talk to it. We then restart both, and can see the UF successfully calling home to the Deployment Server. 09-03-2018 23:34:21.378 +0000 INFO DC:HandshakeReplyHandler - Handshake done. Can a fake DS still work? After disabling the DS-side authentication requirement, the UF is able to connect to the DS immediately — even though it is sending a pass4SymmKey that does not match the DS. Because the DS is no longer demanding a pass4SymmKey, what the client sends does not matter. So, this proves more-or-less that pass4SymmKey is helpful for one of our requirements, but not the other. We’ve shown that pass4SymmKey does an adequate job of only allowing authenticated UFs to connect to a DS, but it does not provide strong enough authentication properties to prevent a client from connecting to a fake DS. An attacker could, through several different techniques, trick your UFs into connecting to an attacker-controlled Deployment Server. The Deployment Server can cause execution of arbitrary code on any Deployment Client connected to it, as the user running Splunk on the Deployment Client. Your Deployment Server should be as robustly protected and monitored as your Puppet, Chef, SCCM, or other configuration management services. If you want to protect your clients from connecting to a fake DS, then you will have to take the route of correctly configuring TLS on the Deployment Server to use a genuine CA-issued certificate (internal or external CA), and enable the deployment clients with the proper root chain, as well as enabling sslVerifyServerCert and commonNameToCheck. Based on this testing, I’m going to go back to the excellent Splunk Docs team and suggest some edits to this section of the docs to make clear the difference in these two properties and how to best achieve each. Look for updates here and there. Lee on Back from the brink?